Hugh Johnson, the well known wine authority and writer draws an interesting comparison between sherry and champagne. Both wines are white. Both wines are distinctly different from table wines: one is a spar­kling wine, and the other is a fortified wine. Both need long traditional treatment to achieve their special charac­ters. Both have a distinction given them by the chalk soil required for best qualities. Both are at opposite ends of the climate spectrum for grape growing and "both are revivifying aperitifs, of which you can drink an asto­nishing amount in their coun­tries and only feel more alive than you have ever felt before". Authentic sherry comes from only one place in the world... from Jerez De la Frontera in Spain. 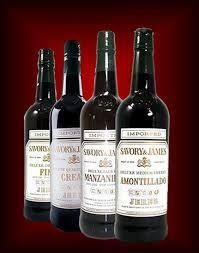 Our sherry was made by one of the lea­ding producers in Jerez, Fernando A. de Terry, for the shipping firm of Savory & James. Many sherry shippers have English origins. They order blends to individual specifications and export them under their label. All Spanish sherry involves a lengthy ageing process by the Solera system. Basically it consists of transferring young wine to a barrel, ageing it for a while, then adding some of it to a barrel containing older wine, and then repea­ting the process to some still older wine. These bar­rels are stacked in rows, one row on top of the next, with the oldest at the bottom, and the youngest at the top in huge bodegas (above ground storehouses). It is said: "the key to the solera system is that the aged sherries in the bottom barrels educate the younger sherries which are placed into them by giving them character and taste of the old sherry". The principal grape used is the Palomino. Small quan­tities of Pedro Ximinez and Mantuo Canoczo grapes are also used. After picking, the grapes are spread on grass mats in the sun to concen­trate their juice. They are then pressed and fermented. Solera ageing, blending, clarifying, and fortifying follows, to produce the final form of each type of sherry. Our sherry is deep golden yellow in color. It has a clean nutty aroma, with a hint of the fruit coming through. It has a dry taste, which continues into a nutty, fruity character, then finishes with a hint of the "flor" taste that is so characteristic. Serve well chilled, as an aperitif, with bold flavored hors d'oeuvres meats, sharp cheese, smoked foods. Try this Mediterranean tradition!